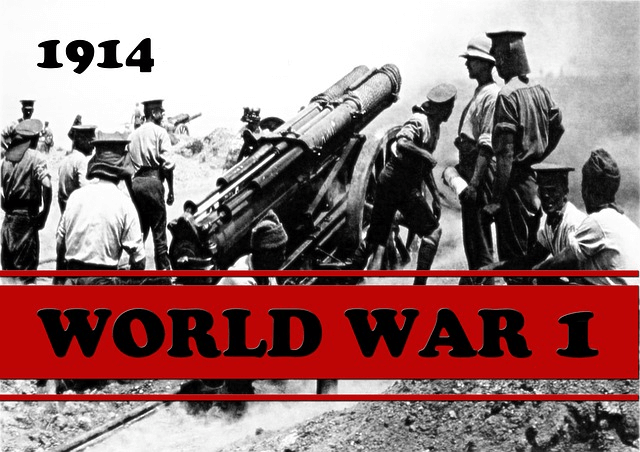 First World War (World War I) is considered as one of the largest wars in history. The world’s great powers assembled in two opposing alliances: the Allies (British Empire, France and the Russian Empire) versus the Central Powers (Germany and Austria-Hungary). WWI lasted from 28 July 1914 to 11 November 1918. Conflict between old imperialist countries (Eg: Britain and France) vs new imperialist countries (Eg: Germany). German railway line – from Berlin to Baghdad. Pan Slav movement – Russian, Polish, Czhech, Serb, Bulgaria and Greek. Triple Alliance or Central Powers (1882) – Germany, Italy, Austria-Hungary. Triple Entente or Allies (1907) – Britain, France, Russia. Note: Although Italy was a member of the Triple Alliance alongside Germany and Austria-Hungary, it did not join the Central Powers, as Austria-Hungary had taken the offensive, against the terms of the alliance. These alliances were reorganised and expanded as more nations entered the war: Italy, Japan and the United States joined the Allies, while the Ottoman Empire and Bulgaria joined the Central Powers. Secret agreement between Britain and France allowing Britain to control Egypt and France to take over Morocco. Germany opposed, but settled with a part of French Congo. Hague conference of 1882 and 1907 failed to emerge as an international organisation. Many Balkan nations (Serbia, Bulgaria, Albania, Greece and Montenegro) were under the control of Turkey. They defeated Turkey in the First Balkan War. The subsequent war was between the Balkan countries themselves – Eg: Serbia vs Bulgaria. Defeated countries like Turkey and Bulgaria sought German help. During German unification, Germany got Alsace-Loraine from France. France wanted to capture Alsace-Loraine back from Germany. Group 2 (Central Powers): Austria-Hungary, Germany, Italy, Turkey, Bulgaria etc. War on Western Side: Battle of Marne. War on Eastern Side: Battle of Tennenberg (Russia was defeated). War on the Sea: Batter of Dogger Bank (Germany was defeated), Battle of Jutland (Germany retreated). Russia withdrew in 1917 after October Revolution. Leaders: Clemenceau – France, Lloyd George – Britain, Woodrow Wilson – USA, Orlando – Italy. Treaty of Paris – with Germany. Treaty of St.Germaine – with Austria. Treaty of Trianon- with Hungary. Treaty of Neuilly – with Bulgaria. Treaty of Severes – with Turkey. Rule of King ended in Germany: Germany became a republic on November 1918. The German Emperor Kaiser William II fled to Holland. Around 1 crore people were killed. Emergence of USA as a super power. Beginning of the end of European supremacy. Japan became a powerful country in Asia. Poland, Yugoslavia and Czechoslovakia became new independent states. Baltic countries – Estonia, Latvia and Lithvania – became independent. Rule of Ottamans came to an end in Turkey. New boundary lines were drawn for Austria, Germany and Turkey. Strengthened independence movements in Asia and Africa. League of Nations came into being. Germany had to return Alsace-Loraine to France. Germany gave up Saar coal field. Germany gave up Polish corridor, and made city of Danzig independent. Monarchy was abolished in Germany, Austria, Hungary, Turkey and Russia. The harsh clauses of the Treaty of Versailles finally resulted in the second world war.